Introducing Victory, the spiritual heir of Captain America. 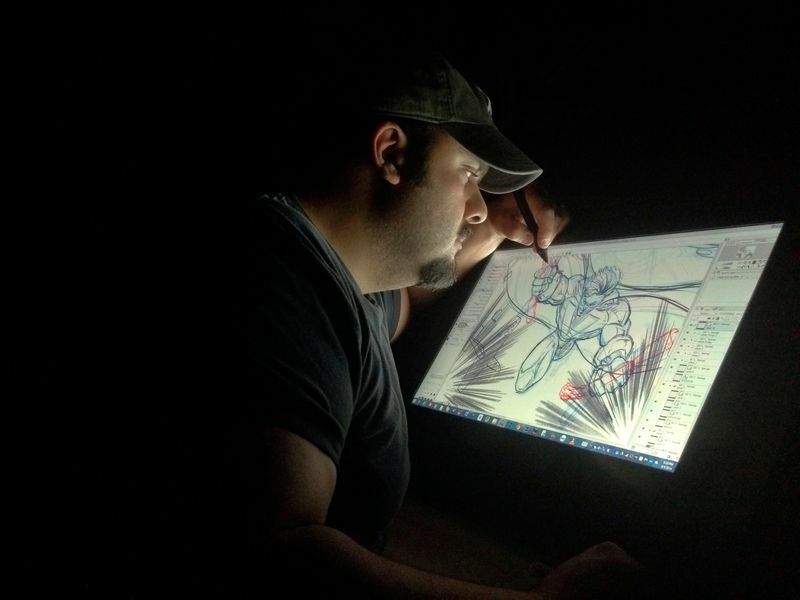 Peter Pachoumis’ work has appeared in DC Comics, Image Comics, and Popular Science magazine, among other publications. 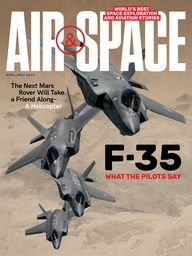 He spoke with Senior Associate Editor Rebecca Maksel in August, and drew the illustration on this page exclusively for Air & Space readers. Air & Space: How did you get started as an artist? Pachoumis: I started out like most people do: As a kid, my mom saw that I was interested in art; she encouraged me, and it grew from there. Do you remember the first comic book you ever read? It was an old Jack Kirby Tales of Suspense with Captain America, set during World War II. It doesn’t get any better than that. Which illustrators have most influenced your work? Jack Kirby [best known for Captain America, Fantastic Four, Hulk, X-Men], John Buscema [The Avengers and The Silver Surfer], Neal Adams [Superman, Batman, and Green Arrow], and John Romita [Spider-Man]. Through their work, each artist has given me private art lessons. Granted, I don’t think any of them knew that a kid from New York City was dissecting every line and nuance of their work. What’s the best part of drawing some of these iconic characters for DC Comics? You want to be able to add a little bit to the icon. Here’s an example: When I had a chance to work on the Batman comic book, I drew the Riddler. And when I did the Riddler, I wanted him to have a little of the vibe of the 1966 “Batman” TV show, but also have a touch of evil in him, which the 1966 “Batman” didn’t have. Just a hint that there is something really not right about this guy. You’ve drawn aircraft for some of these characters. How closely do you have to stick to reality? It all depends on the project. Sometimes I can use the aircraft as a framework and design something around it. Other times I stick very close to the actual aircraft. In Pachoumis’ illustration, the P-51 Mustang, a favorite of model makers and warbird fans, flies overhead, while Victory crushes German Panzerschreck rounds with his bare hands. Can you tell us a little about the cartoon you’ve drawn for us? 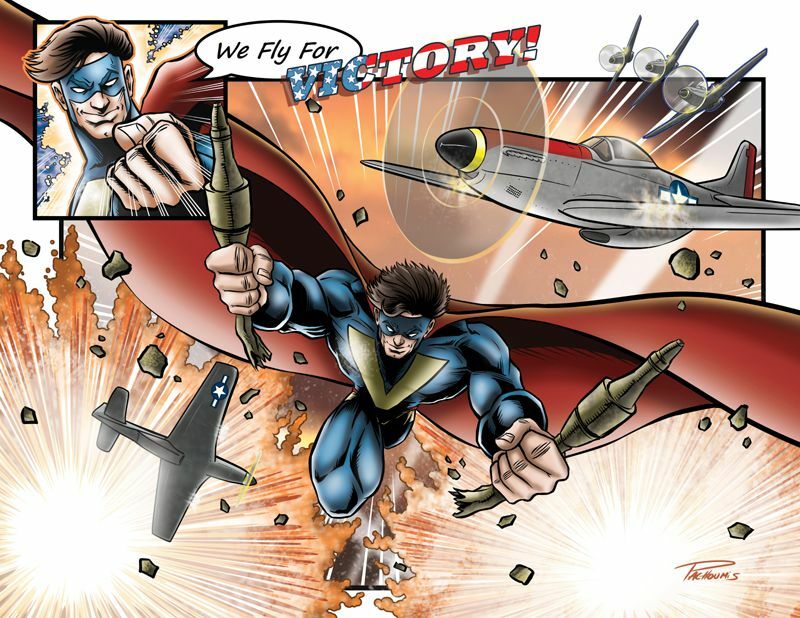 The character’s name is Victory, and he helps fight the Axis threats during World War II. I created him initially to illustrate my marketing materials, but he’s taken on a life of his own, and I’m now planning a series of illustrations based on his adventures during World War II. Download the full-size illustration here.